LED stands for Light Emitting Diode, which is a computer chip encased in a glass-like resin, which emits therapeutic wavelengths (or colours) of light energy. Not to be confused with sunbeds or laser, the light therapy was originally developed to fast-track the healing of wounds and post-surgery scars. The rejuvenation of healthy skin, too, was a happy coincidence. Light therapy dates to the Greeks, when it was known that exposure to light, or heliotherapy, could be beneficial to health. The use of colour healing has been recorded as far back as the ancient Egyptians. Nature was an important factor in their culture, influencing their use of colour in many aspects of their lives, including healing practices. Colours were also associated with gods. With a strong focus on worshiping the sun, they believed that shining the rays of light through coloured crystals could penetrate the body and act as a treatment for ailments. Different rooms were built for individual colours to concentrate their powers. Ancient Egypt is believed to be one of the first civilizations to discover how to use colour therapy and phototherapy, or light therapy, for healing. 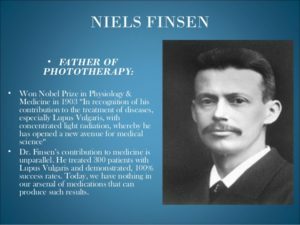 In the 19th Century, a Nobel Prize was awarded to Dr. Niels Finsen, a Danish Physician who demonstrated the beneficial effects of various wavelengths in the treatment of tuberculosis. This same technology has proven to be effective in the fields of dermatology, neurology and physiotherapy. Forty years of independent research have shown that Light Therapy has powerful therapeutic benefits to living tissue. 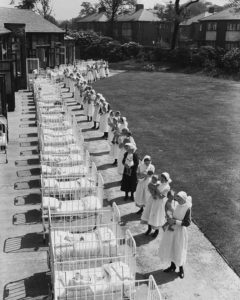 In the 1960’s in Europe it was noted that certain single wavelengths had excellent therapeutic effect on treatment tissues through a process called photo-stimulation. 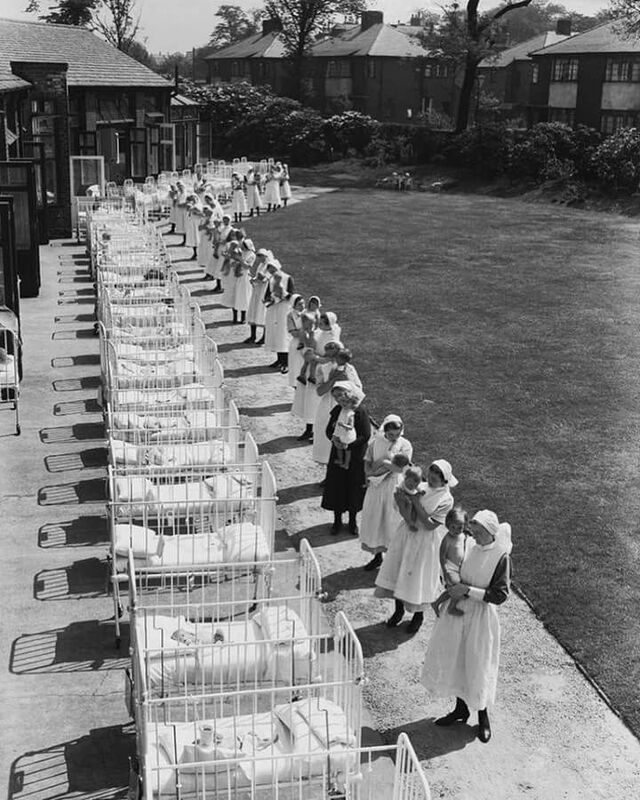 One example is the practice of “light-treating” babies for jaundice, a common condition of new-borns. More recently, cancer researchers have noted that a single red frequency combined with a topical cream kills certain types of skin cancer cells. Researchers also noted that it stimulated skin tissue to regenerate and improve the appearance of the skin. Circulation is increased and fibroblastic activity, collagen production and healing are promoted. This effect has produced very positive results in the treatment of rosacea, anti-aging and sun damage. 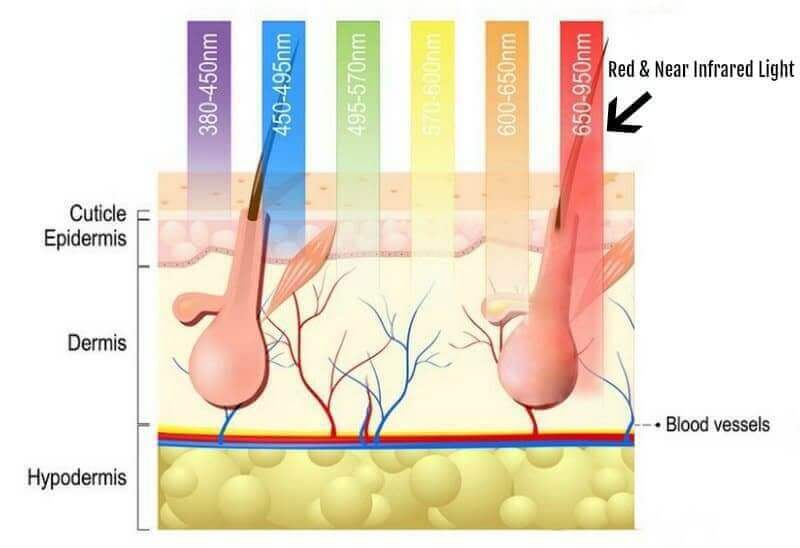 Different colour lights penetrate at different depth in the skin, therefore you’ll use a combination of different lights depending on your desired result. So, depending on your treatment when the therapeutic light energy is in the correct wavelength, the cells in the dermis layer of skin will convert that light energy into ATP (adenosine triphosphate), which is the fuel that the cell uses to do its job. The fibroblast cells in the dermis layer have the job of producing collagen (which give the skin fullness or that plumped look) and elastin (which give the skin the ability to bounce back). 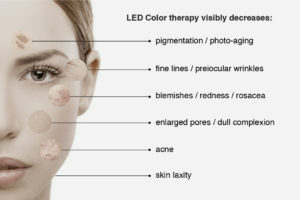 Thus, LED gives the cells a ‘full tank of fuel’ and these fibroblast cells start to produce collagen and elastin like when one was 20-25 years old.The result is the complexion is plumped up with new collagen (which pushes the folds of the wrinkles out) and new elastin (which helps to tighten the skin and give it more elasticity). Another drawcard is that there’s no downtime and it can be done on a lunch break. In-salon treatments are recommended two to three times a week for a course of four to six weeks. Ideal for pre-wedding prep or before a big event, a session only takes between 15-30 mins. It’s also an effective and pain-free approach to treating skin concerns such as hyperpigmentation and adult acne. 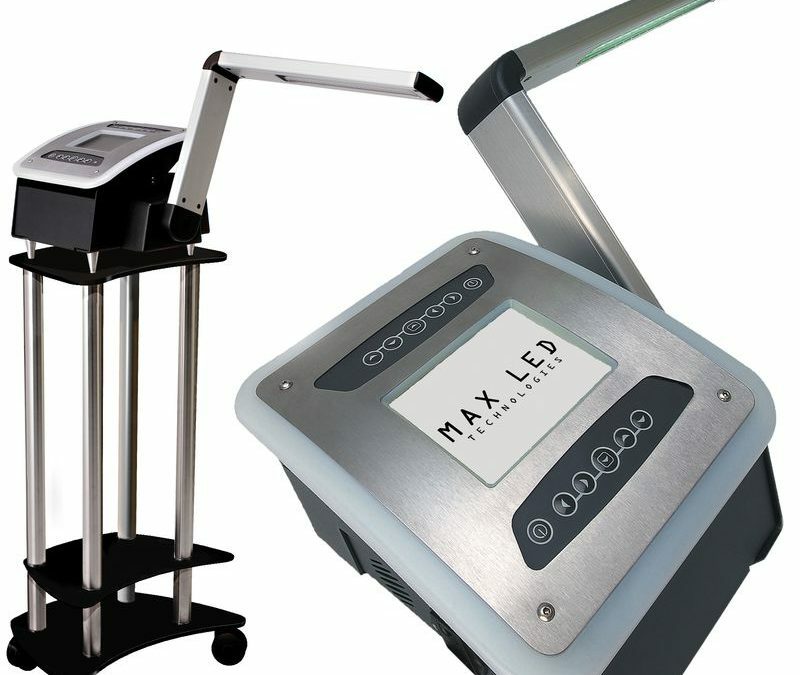 Max+ LED is great for those who want to minimise the visible signs of aging, reduce breakouts bringing clarity to the skin, repair the skin’s barrier and speed up the skin’s natural healing process to reduce redness, calm, and even out skin tone. 10 – 12 treatments are recommended for ultimate results to skin, reducing pores size, brightening the skin and rejuvenating the youthful look of your skin. It is the only aesthetic device that has no contra-indications of any kind. It is good for all skin types, colours and conditions. It is safe for the eyes and it cannot be overused. While there have been conclusive studies of the effectiveness of LED light therapy, of course always listen to your skin therapist. If you have a poor diet or spend too much unprotected time in the sun, it can take a little longer to see results. Red and infrared LED lights work synergistically to deliver optimal skin rejuvenation. This combination of LED lights is ideal for deeper lines and wrinkles, scarring, and promoting a more even skin tone. 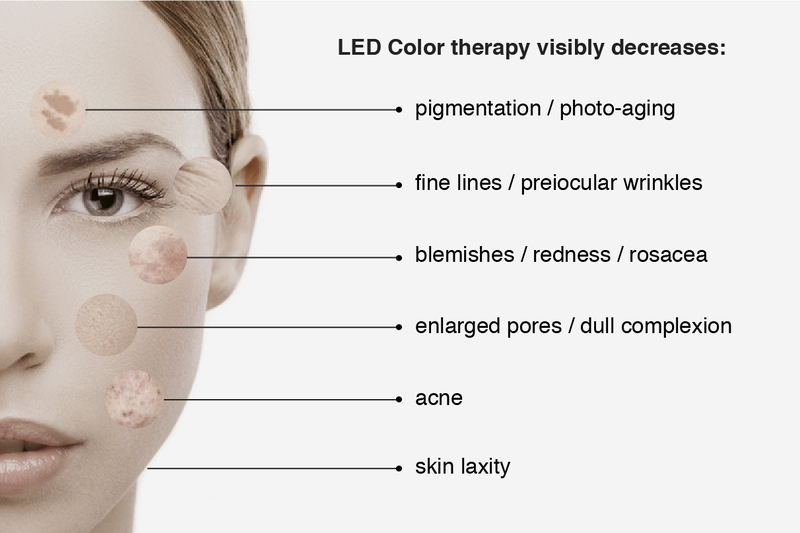 FOR ANY FACIAL BOOKED FOR THE MONTH OF APRIL 2019, YOU’LL GET A FREE LED LIGHT THERAPY TREATMENT TO TRY IT OUT. JUST USE THE ADD-ON SERVICE WHEN YOU BOOK ONLINE OR MENTION TO YOUR THERAPIST WHEN YOU BOOK, WE’LL DEDUCT THE AMOUNT AT THE TIME OF PAYMENT.